On Wednesday, 4-star (HV Rating: 91.5) offensive tackle Bryce Benhart‍ signed his letter of intent to become a Husker. He is my No. 3 Early Signing Day Greg’s Guy. Benhart is undoubtedly one of the most talented players in the class. In addition, he is the least likely to give an interview and is the only player in the class I didn’t talk to at some point during the process. That’s not a good or bad thing, just an interesting observation. The lineman is a culture builder in this class. If there was going to be a player to embody the type of no-nonsense, do-your-job culture that Greg Austin hopes to build on his offensive line, it’s Benhart. He doesn’t really like talking about his recruitment and chose to focus on helping his team win a state title. By all accounts, Benhart is a hard worker and a tough competitor. He’s exactly the type of “fit” that you want to rebuild the pipeline. The Minnesota mauler is a tremendous tackle prospect that projects to right tackle at the college-level. There are many people, myself included, that feel that he is actually underrated by recruiting services with his ranking because he was not evaluated enough and didn’t attend camps. I expect his rating to jump after he goes to San Antonio for the U.S. Army All-American Game. 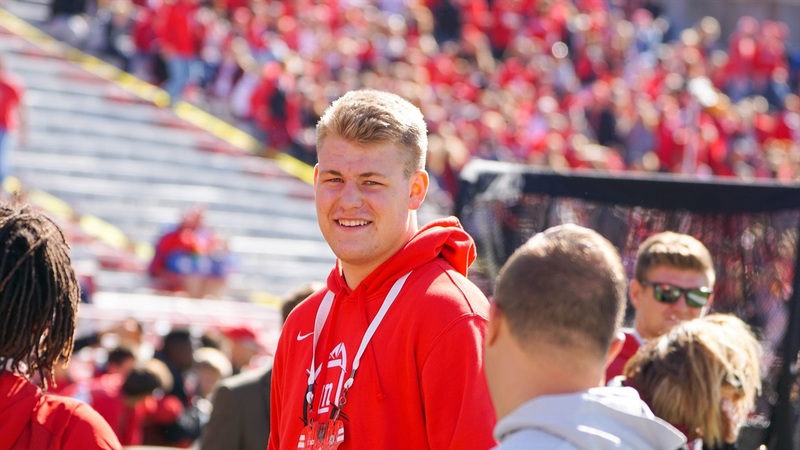 Benhart, who stands at 6-foot-8, 303-pounds, is the leader of a really intriguing group of linemen joining the Huskers in the 2019 recruiting class.